Everyone (who’s used angular or seen an angular tutorial) has seen the awesome realtime angular search. This is used with a filter property, but there are more complex things you can use with filtering. On my Hack Reactor hackathon project I used filtering for just about everything. From picking out individual objects to finding just the right combinations and I learned some awesome tricks and some pitfalls to avoid. They way this works the best is if you have a number of searches all on one page to pull together. Say a regular text search (text above) that needs to interact with a drop down menu filter (category). Just throw all the variables into one object and filter on that. Another neat thing you can do is filter by IDs. For example, if you want to have individual pages for each item, you can normally just call to it based on the $index of that item. But what if you have searched and filtered your list of data into a more manageable grouping? Index doesn’t work! It’s pulling the index of the new filtered list and not the actual index that data point has in the entire data structure. My fun work around for this was to send the object that you had selected to a function within my Angular controller for that page and find the data that way. Of course this requires something in the $rootScope, but that also benefited me because I wanted to have access on a separate page to all of the data points a user chose. That way I could fill out a detailed report of the chosen bookmarks with user defined notes all on one screen. Do you have all the data and none of the visuals? Do you just want a pretty, fast way to compare lots of data that centers around maybe just a handful of moments? D3.js can help you tame all of your data and d3.rollup is especially useful if you have lots of data that you need to combine into just a couple of data points. All it takes is a couple of (pretty long) lines of code and you will have an awesome visual that’s very customizable. Now obviously there are a bunch of these, and technically there are easier ways to do this, but to show off the structure of a rollup, lets count how many entries we had in our database using a d3 rollup! Remember, data here is my array of JSON entries, so in our rollup function the d is just shorthand for all of the data. This isn’t a very interesting example though, lets take a look at something that really shows off the beauty of a d3 rollup. Now there is a lot going on in this very compact few lines, so well go through them one by one, but the result is that averages is equal to an array of objects with the properties key (that is equal to each unique timestamp) and value (that is equal to the mean of all votes at that timestamp). .key(...) is just used to tell the function what our keys are, only grabbing unique values of that property. .sortKeys is just a prettiness thing, it sorts my keys into an order (when they’re pulled off the server the only order is by the time they were created on the database). and finally our lovely .rollup(...). Now instead of d being an array of the whole data, it’s now an array of only the data for each individual key (so all of the data with the same timestamp). The inner function d3.mean takes a specific property from all of the data for each key and averages them up. And that, is d3 rollup in a nutshell, it’s really lovely at coercing relationships out of your raw data and you can obviously do a lot more with it that just averaging things. The d3 nest docs are probably the next best place to look to get your hands dirty (.rollup is a property of nest). While it might be possible that I’m the only person out there who didn’t want to hassle with creating a Postgres database on my computer that needed to be passed around to my project-mates, I have a feeling there is one lost soul in the universe besides me who might find this useful. When I first tried to use Heroku’s PostgreSQL database add-on the only documentation I really found was for attaching it to existing Heroku apps. I just wanted a dev environment and currently don’t have plans to deploy the app with Heroku so I just wanted to “borrow” their free level of database storage. I just plugged all of that info into Sequelize (see my previous post), because I’m using Heroku Postgres, I had to make sure I used the pg.native options in both Node and Sequelize. A few caveats! For a Mac, if you just install the Postgres standalone app from PostgreSQL, life will not be pleasant (I learned this the hard way). 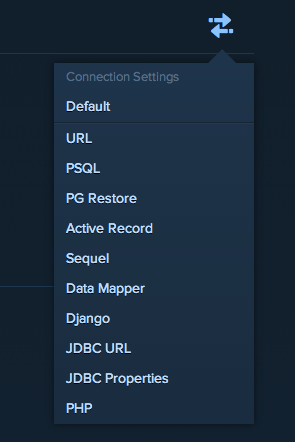 The easiest way to make life happy is to use Homebrew to install Postgres. Please have Homebrew, it makes life super easy. All you need to do then is brew install postgresql. The second awesome thing about Heroku Postgres is that although I’m only on the free version, I can still easily log in to my database from the command line and change things. On the page with the connection info, click the double arrows on the right and choose URL. Now, in Terminal type psql DATABASE_URL_HERE and voila! direct access to your database.